Choosing the ideal car that will fulfill all your purposes is quite a tricky job. Prior to purchasing the right car, one needs to go through a lot of key decisions. Maruti Suzuki Nexa Ciaz has introduced some revolutionary changes in its services and has become one of the most desirable cars brands in India. Ciaz has some unique features which include – fuel efficiency, a hugely active service network and cost-effective offers from the right dealers . Maruti Suzuki introduced the brand Nexa with the purpose of boosting their customer reach to a maximum and providing them quality car services. With the launch of Nexa, Maruti Suzuki has redefined their brand value providing a luxurious touch with a global outreach in its models. 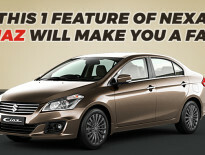 Why Make Ciaz your Next Car? Capacity and Size – The car looks stylish and elegant from all sides and its dimensions should not be a problem for finding an adjustable parking space. It is massive and has enough space to carry four people along with children. It is brilliant to carry lots of stuffs in its 510 data capacity booth. It is very comfy and is ideal for long journeys. Maintenance is easy – Ciaz is a lot more cost-effective when it comes to maintenance. It makes a clear mark with Maruti’s assurance for a long period of time. Maruti’s phenomenal outreach makes sure the customer avails premium quality services at regular intervals. Hence, customers can have complete assurance for any kind of care services regarding replacement, cleaning or oiling. Moreover, you can visit a reliable car Maruti Nexa dealer to enjoy hassle-free maintenance services. It offers petrol as well as diesel variants and comes with a smart hybrid technology that keeps this car ahead in the race from its competitors. The dual air bags and abs with EBD stands out in the safety department and significantly ups its desirability quotient. The model comes with keyless entry and easy push-to-start and stop button. The smart system has a speed-dependent volume control. It analyzes the speed of car and accordingly decides the car volume. The auto start option comes with a temperature sensor and hidden antenna. The pre-tensioner system offers more security through the seat belts during huge impacts. Final Verdict: These highly impressive features make the Ciaz, best in terms of overall quality in this price range. Choosing the right car which will get through all the necessary factors is a must. Nexa Ciaz is one such car that functions as an all-rounder!